As soon as a post goes up, it’s natural to obsessively monitor likes, comments and reposts. There’s rising awareness of the interplay between these different sorts of reactions. “The ratio” is how many comments a post gets compared to likes and reposts — the mathematical formula is: comments / (reposts + likes). It’s especially associated with Twitter since those numbers are conveniently lined up right under tweets. If comments exceed retweets plus likes, that’s a bad sign of getting a negative reaction. More than double indicates a failed tweet, unless trolling (or maybe spurring conversation) was the intention. When the ratio gets beyond 10, that’s the territory of the Hindenburg, the Fyre Festival and The Emoji Movie. Why is it bad to have more comments than retweets and likes? By definition, likes indicate being well received. And retweets are generally endorsement too, unless done sarcastically to present something that’s obviously a weak take. While comments might support a tweet, they also often debate, criticize, upbraid, lampoon, castigate etc. 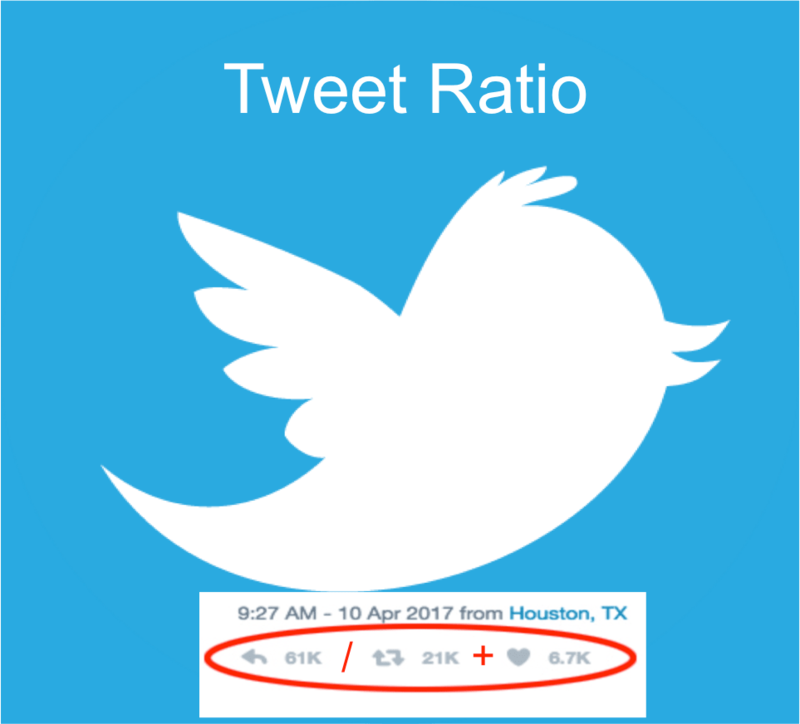 A ratio of 0.5 means there’s balance among comments, likes and retweets, indicating a tweet that’s hit pretty solidly. In that scenario, most of the comments tend to be favorable, or at least neutral. The number of comments exceeding retweets and likes indicates that not many people who saw it were motivated to endorse or to share with their followers, but people did have something to say about it. Those comments are most likely negatively skewed, more than the comments on a sub-1 ratio tweet. 6,000 comments / (186 retweets + 503 likes) = 8.7, quite a bit more than one. So, do the comments skew negatively? 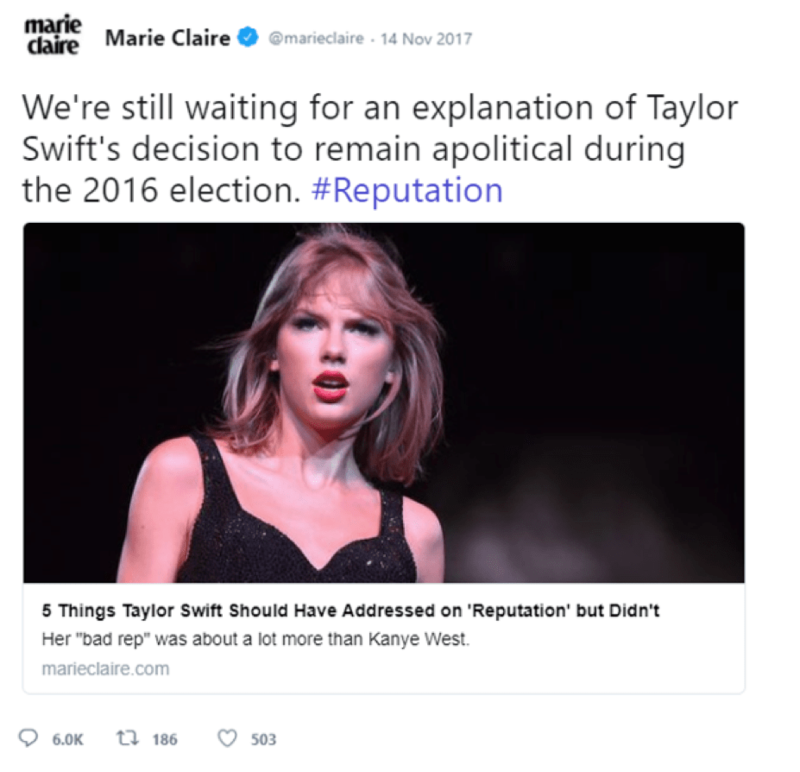 It’s practically impossible to find one endorsing Marie Claire’s take. Swifties don’t like Tay Tay getting called out about sticking to music without mixing in politics. The comments include “No marie, we are not, just hoping you get a life”, “Maybe because she realized fans don’t want to be preached to by entertainers” and of course “Leave Taylor alone”. 1,800 / (14 + 75) = 20.2. That’s more than double the ratio size associated with disaster! But who would have a problem with a tweet celebrating charitable employees? The issue is this was tweeted on the same day that United Airlines was in the news for a dog dying on a flight, after its owner was instructed to store the pet in the plane’s overhead compartment. 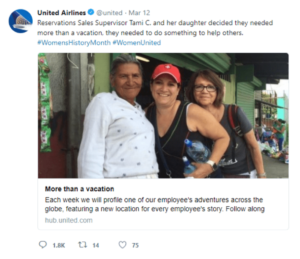 There were no tweets that day by United about the incident, so people chose this tweet for venting reactions like “What’s your public statement? There are many of us waiting to hear it. #united #dog”. If you have been ratioed, what to do next? Perhaps you’re intentionally trolling. That’s generally not an objective of eClincher customers, but if it’s yours, congratulations, and you should relish the accomplishment. Maybe you can match the achievement of a ratio above 20. If you’re not pleased with a high ratio, you can provide your own comments defending your position. This may further inflate the ratio, but at least the comment thread will better present what you have to say and interleave the criticisms. Maybe you’ll even prompt some likes and retweets and get the ratio going in the opposite direction. Generally, the best practice when experiencing a high ratio is to own up to the controversy. If a mistake was made, or the comments are persuasive, an apology may be appropriate. Some self deprecation can alleviate the tension. And to really persuade followers, including the commenters, that you’ve reformed, you could offer penance like a relevant charitable donation. The remaining consideration is whether or not to delete the tweet. Just bear in mind that if the critics who commented are already sufficiently outraged, this action might just be pouring gas on the controversial fire. If you have been ratioed, ultimately, the best overall course forward is to become a little wiser and get back to posting soon, with greater consideration of how things get received and what to post or tweet accordingly.